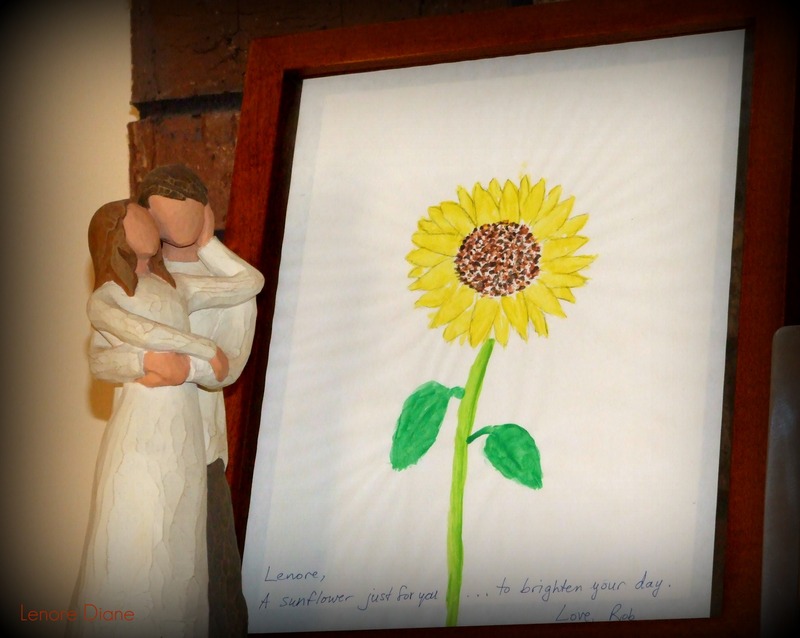 A figurine, given to us as a wedding gift, stands next to a picture of a sunflower Rob drew for me several years ago. (The sunflower is my favorite flower.) The frame, holding the drawing, was a wedding gift from one of my bridesmaids. This picture reminds me of my love for Rob and my friends. Caffeine, please carry me through the year. Howdy, Melinda! Nice to ‘see’ you here. Glad you liked the picture (and stopped by my place). Thanks, Darla. Rob is artistic, but he rarely puts pen (or brush) to paper. When he drew this flower and gave it to me, I was thrilled. Perhaps I should not reply at all then? Glad you liked the picture, Arindam. Thank you. It is the icing on the cake, isn’t it Maxi? Hugs to you, my blogging friend. What fun to see your beloved’s talents. Thanks, Georgette. I’m happy to add that Joe seems to have his Dad’s artistic ability, too. I love your blog layout and photo’s…Lenore Diane I just joined the challenge Project 365 and it’s the first week, stop by and we can become blog buddies for this years photo’s. I look forward to reading and seeing what you do! Welcome to the neighborhood, Jackie. Thank you for your kind words. Congrats on joining the WordPress challenge. I will certain pop by and check out the photos. Happy new year! Sweet memories, and love that lasts. Nothing better. I agree, Mags; and, I do love it. Glad you liked it, too. A very sweet reminder to love each and every day. Wonderful. I think so, too, Bella. Thank you! Will not say “aww”. Will stifle intense urge to say “sweet”. Won’t do it…will resist..resist..resistance is futile! You’re a lucky girl, Lenore. I love the sunflower – and Rob’s sweet comment on the bottom is, indeed, delightful. Thank you, MJ. I agree with you. What a lovely trio of mementos. A trio for day 3 – I just realized that. Funny. Thank you, Linda. That’s almost enough to melt my stone heart, Ms. D! Almost, eh? I’ll see if Rob can create something else for me. 🙂 Thanks, SIG!